Starting a home business is an exciting endeavor and something that many people have planned for many years. Getting up and running can be a challenge, but there are few things more rewarding than those first few signs of success. Once you have your operation moving smoothly ahead, you may find that you do not have the space you need to expand or run things efficiently. That is where the team at Zippy Shell Greater Columbus comes in. We have mobile storage solutions that can help you make the most of the space that you have, yet keep your items easily accessible. 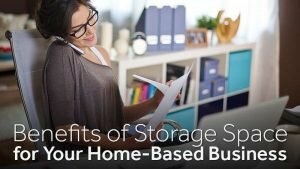 The following are just a few reasons why portable storage makes sense for a home-based business owner. A vast body of research supports the notion that excessive clutter can have a detrimental effect on productivity. The mind has difficulty focusing when there are things piled and stacked on every available surface, and when there is insufficient room to move through the workspace with ease. Putting those items that are not in daily use into a safe and secure storage shell is an excellent way to clear the clutter and promote increased productivity. Best of all, the stored items can be brought back as needed, with just a simple call. When running a home-based business, few people have the luxury of an entirely unused room just waiting to be transformed into office space, work space, inventory storage or a showroom. Most of us have to make use of a room within our home to fill all of those needs, and that room is often already filled with furniture or other items. 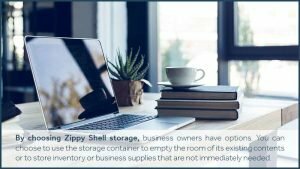 By choosing Zippy Shell storage, business owners have options. You can choose to use the storage container to empty the room of its existing contents or to store inventory or business supplies that are not immediately needed. Either way, gaining access to those items is as simple as scheduling the container to be brought back to your home. When a home-based business is successful, the owners often find that they need to stock more inventory than initially anticipated. Being able to fill a big order at the last minute can mean a big boost in profits, as well as establishing a reputation for coming through on short notice. To expand inventory capacity, it is often necessary to look at storage options outside of the home. That’s where Zippy Shell comes in! We can drop off a shell at your location to be packed according to your specific needs, then transport it to our safe and secure storage location. When you need access to your items, simply call and schedule a drop-off time. Once you are done, we can come back and take your shell back for storage. We invite you to contact us today to learn more about our services, and to find out how Zippy Shell Greater Columbus can help you make your home-based business a success! We have storage specials available today. Get your free quote!